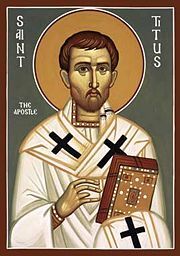 Saint Titus of Crete, the recipient of the Epistle to Titus. While the letter is addressed from Paul, many scholars today doubt that it and the other pastoral epistles are truly by the Apostle, due to issues of style, circumstance, and references church offices—elders and bishops—which were not otherwise evident in Paul's day. The letter takes a harsh attitude toward those who disagree with the writer, attacking their characters is strong words and urging that they be shunned after no more than two warnings. The Epistle to Titus is traditionally dated to the end of Paul's ministry in the late 60s C.E., while critical scholars date it between 80 C.E. and the mid-to-late second century. The letter is addressed from Paul to Titus, a significant person in 2 Corinthians who is also mentioned in Paul's letter to the Galatians as Paul's companion at the Council of Jerusalem who was allowed fellowship with the Jerusalem church even though he was uncircumcised (Gal. 2:1). In 2 Corinthians, Titus plays an important role in reconciling Paul and the Corinthian church, where a serious breach had occurred. "arguments and quarrels about the law," probably a reference to Roman law, but possibly having to do with the question of which if any the Jewish commandments apply to Christians. Scholars consider the Pastoral epistles to be written by the same author. Titus has a very close affinity with 1 Timothy, sharing similar phrases and expressions and similar subject matter. While these epistles are traditionally attributed to Paul of Tarsus, most scholars today consider them pseudepigraphical. The author of Titus identifies himself as "Paul, a servant of God and an apostle of Jesus Christ." Scholars who believe Paul wrote Titus date its composition from the circumstance that it was written after Paul's visit to Crete (Titus 1:5). However, most scholars agree that this visit could not be the one referred to in Acts 27:7, when Paul was on his voyage to Rome as a prisoner, and where he continued as a prisoner for two years. Thus traditional exegesis supposes that Paul sailed from Rome into Asia, passing Crete by the way, and that there he left Titus "to set in order the things that were wanting." Thence he would have gone to Ephesus, where he left Timothy, and from Ephesus to Macedonia, where he wrote the First Epistle to Timothy, and from there, according to the superscription of this epistle, to Nicopolis in Epirus, from which place he wrote to Titus, about 66 or 67 B.C.E. Doubt about Paul's authorship of Titus has been expressed by critical scholars since the mid-nineteenth century. According to Easton's Bible Dictionary (1897), "Paul's Authorship was undisputed in antiquity, as far as known, but is frequently doubted today. It was probably written about the same time as the First Epistle to Timothy, with which it has many affinities." All three Pastoral epistles are widely regarded by contemporary scholars as being pseudepigraphical. On the basis of the language and content of the epistles, many scholars believe that they were written after Paul's death by someone who honored his spirit and wished to invoke Paul's name in dealing with problems of a later time. Critics examining the text find its vocabulary and literary style unlike Paul's unquestionably authentic letters, see the life situation of Paul in the epistles as inconsistent with Paul's reconstructed biography, and identify principles of the emerged Christian church after those of the apostolic generation. In the view of critical scholars, Titus is dated from the 80s up to the end of the second century. The Epistle to Titus emphasizes a number of themes that became important in Christian history. Although other Pauline epistles speak against the Judaizers forcefully, here they are presented as veritable heretics, who should be shunned by the church. In the unquestioned Pauline letters and the Book of Acts, Paul himself fellowships with Judaizers at Jerusalem and Antioch, although he clearly disagrees with them. 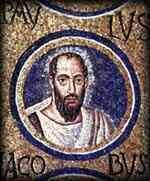 According to Acts, Paul even had his spiritual son Timothy circumcised, since his mother was Jewish (Acts 16:1-3). The implication is that Paul—or at least the author of Acts—did not object to Jewish Christians being circumcised, although he strenuously objected to the practice for Gentiles, for whom he believe it was unnecessary and contrary to Christian teaching. 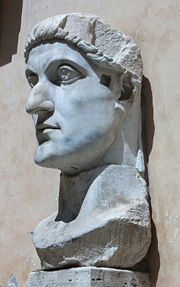 The attitude and language of the Epistle to Titus ("detestable, disobedient and unfit for doing anything good") against the "circumcision party" was picked up by the later church in the teaching, for example of Constantine I: "... Let us then have nothing in common with the detestable Jewish crowd; for we have received from our Saviour a different way." Saint John Chrysostom adopted a similar posture in ordering Christians to refrain from fellowship with Jews. Circumcision was later banned by Christian authorities in some areas, and—if practiced by Christians of Jewish background—was seen as evidence of false conversion, a capital crime, during the Spanish Inquisition. In a more positive vein, the epistle's insistence that presbyter/bishops be the husband of only one wife helped solidify the Christian stance against polygamy, even if it also perpetuated the ancient attitude of inferiority of women to men and the institution of slavery. One of the peculiarities of the Epistle to Titus is the inclusion of text which has become known as the Epimenides paradox. Titus 1:12-13 reads (in part) "One of them, a prophet of their own, said, 'Cretans are always liars, evil beasts, and idle gluttons.' This testimony is true." Epimenides of Knossos was a fifth-century B.C.E. philosopher, whom the letter apparently quotes, though not mentioning him by name. The statement is now a famous logic problem, since Epimenides, who came from the Cretan city of Knossos, must therefore have been a liar himself, and not a true prophet. The statement of "Paul" agreeing with Epimenides may also be cited as evidence for the inconsistency of the Epistle to Titus with Paul's theology since he elsewhere emphasizes that all people, whether "Jew or Greek" are equally in need of God's grace. However, some scholars point out that inconsistency is not a compelling argument, since Paul's letters were often hastily composed and his theology was in many regards unsystematic. From the standpoint of church history, the Epistle to Titus presents a revealing view of the situation of the early Christian church attempting to establish its doctrinal authority through the emerging institutional offices of elders and bishops, demonstrating a concern that these men be morally beyond reproach as well as capable of refuting those teachings—specifically Christian Judaism and probably Gnosticism—which contended with orthodox doctrines for popularity. ↑ The idea of appointing elders (also called presbyters, from which the name of the Presbyterian Church is derived), is cited along with the term episcopos, or bishop, by critical scholars as anachronistic, since formal church offices such as these do not exist in the unquestionably authentic Pauline letters. ↑ Bart D. Ehrman, 2004, p. 385ff. ↑ Bart D. Ehrman, op. cit. ↑ Raymond E. Brown, p. 662. ↑ Eusebius. "Life of Constantine (Book III)", 337 C.E. www/mewadvemt/org. Retrieved February 13, 2008. Early Christian Writings: Titus www.earlychristianwritings.com. History of "Epistle to Titus"
This page was last modified on 19 August 2017, at 16:28.